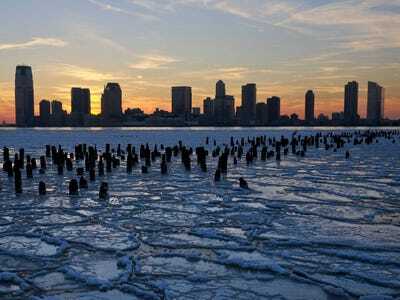 Getty Images/Afton AlmarazNew York in winter. In the US, the Midwest has already seen some serious snow accumulation and January-like temperatures. And people are again invoking the term “Polar Vortex” to discuss the recent weather. Once again the most misused term in weather was uttered, Polar Vortex. Ladies and gents, there is ALWAYS a Polar Vortex, but the shift in the Hadley Cell Winds has allowed the Polar Vortex to come down further into the US than it has in decades. I have written about this ad nauseam ever since Iceland’s Eyjafallajokul volcano erupted and brought European aviation to a near-standstill back in April 2010. What has happened is that since said eruption we have had more volcanic ash in the atmosphere than in recorded history. That has caused the “cell winds” to take a dramatic shift toward the North and South poles. Recall that north of the equator the cell winds rotate counter-clockwise and south of the equator clockwise. They carry the hot equatorial air into the troposphere where it moves toward the poles, typically 30 degrees north and 30 degrees south of the equator. Recently, however, given the volcanic ash, the cell winds have moved decidedly more toward the poles, which is why we are getting droughts and floods in areas where previously this has not happened. Regrettably, this weird weather is here to stay for a while and certain companies like FedEx are going to have to adjust their business models for it. Saut pays close attention to all sorts of natural phenomena. Earlier this year, he was a guest on Barry Ritholtz’s Master in Business podcast and talked at length about the effect volcanic ash in the atmosphere has had on the Hadley Cell Winds.